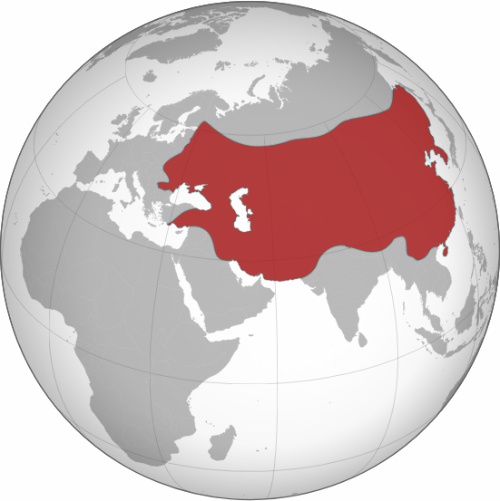 The following brief post is concerned with an early twelfth-century Byzantine ambassador to England who had the intriguing name of Wlfricus—or Wulfric—of Lincoln. Needless to say, this is a most interesting name for the first documented medieval ambassador from Constantinople to England to bear, and what follows looks briefly at what little we know of this embassy and its context. A contemporary imitation of a coin of the Byzantine emperor Alexios I Komnenus (1081–1118), mint of Constantinople, found at South Shields, Tyne and Wear. Click here for a larger version of this photograph. Note, an imperial seal of Alexios I Komnenus has been also been found in England, just a few miles to the north-west of Lincoln at Torksey (image: PAS). A gold coin of the Byzantine emperor Michael VII Doukas (1071–8), in whose reign the English Varangians are thought to have arrived in Constantinople, found at Hambleton, North Yorkshire; the coin has been pierced for suspension and the placing of the hole implies that it was intended to be worn displaying the image of the emperor. Click here for a larger version of this photograph (image: PAS). This specific element of the Laon Chronicle's account has been subject to some scepticism, but it is worth noting that Krijnie Ciggaar considers Hardigt to be a potentially genuine English emigrant who perhaps gained these roles in the later 1080s and 1090s, and Nancy Ševčenko furthermore observes that the seemingly slightly fanciful detail of the lions is arguably supported by a subsequent release of both lions and leopards to attack Lombard Crusaders camped outside the walls of Constantinople in 1101. 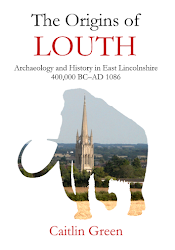 (9) In any case, even setting Hardigt to one side, it seems clear that Wulfric of Lincoln's role as the Byzantine Emperor's ambassador to Norman England not only has a context in terms of the arrival of Anglo-Saxon emigrants in the Byzantine Empire after c. 1075, but also in the evidence for a number of these English exiles apparently fairly rapidly attaining important positions within the imperial household and the wider Byzantine state during the late eleventh century. 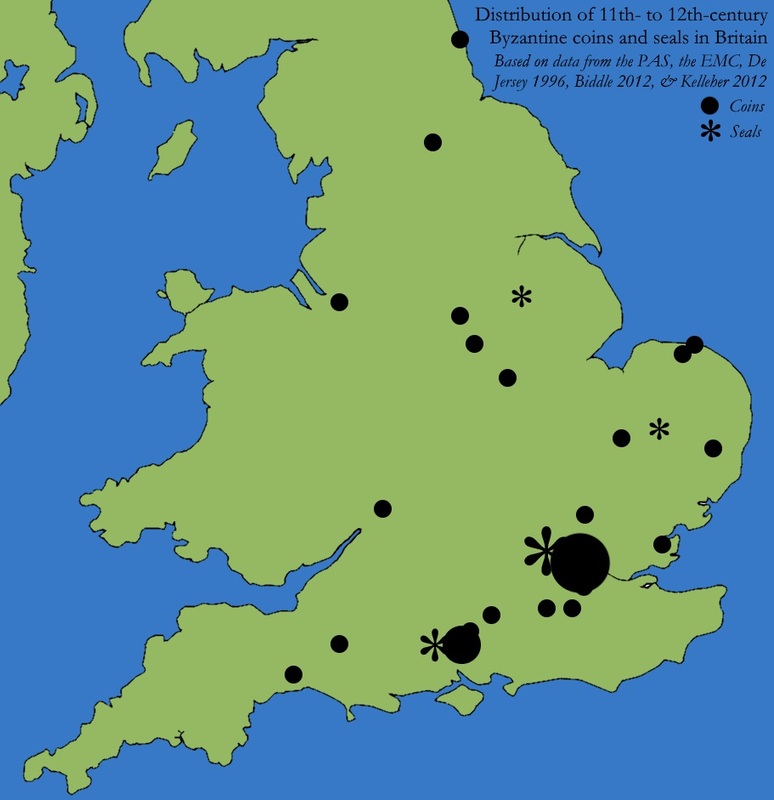 The distribution of eleventh- to twelfth-century Byzantine coins and seals in Britain, based on data from the PAS, the EMC, De Jersey 1996, Biddle 2012 and Kelleher 2012; click here for a larger version of this map. Note the two major concentrations of coins and seals shown on this map represent the finds from Winchester and London (image: C. R. Green). 1. J. Hudson (ed. & trans. ), Historia Ecclesie Abbendonensis: The History of the Church of Abingdon, Volume II (Oxford, 2002), p. 69. 2. 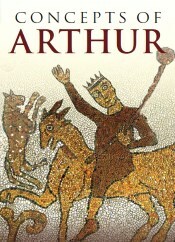 R. Bartlett, England Under the Norman and Angevin Kings: 1075–1225 (Oxford, 2000), pp. 108–09. 3. See, for example, K. N. Ciggaar, 'L'émigration anglaise à Byzance après 1066. Un nouveau texte en latin sur les Varangues à Constantinople', Revue des études byzantines Année, 32 (1974), 301–42; C. Fell, 'The Icelandic saga of Edward the Confessor: its version of the Anglo-Saxon emigration to Byzantium', Anglo-Saxon England, 3 (1974), 179–96; J. Shepard, 'The English and Byzantium: a study of their role in the Byzantine army in the later eleventh century', Traditio, 29 (1973), 53–92; J. Godfrey, 'The defeated Anglo-Saxons take service with the Byzantine Emperor', Anglo-Norman Studies, 1 (1979), 63–74; K. N. Ciggaar, Western Travellers to Constantinople: The West and Byzantium, 962–1204 (Leiden, 1996), pp. 140–1, 144, 146, 158–9. 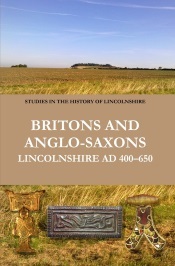 The connection between Wulfric of Lincoln and the English Varangians was first made by E. A. Freeman in his History of the Norman Conquest of England, 2nd edn (Oxford, 1876), vol. 4, pp. 847–8. 4. S. Blöndal & B. S. Benedikz, The Varangians of Byzantium (Cambridge, 1978), p. 180; J. Shepard, 'Another New England? 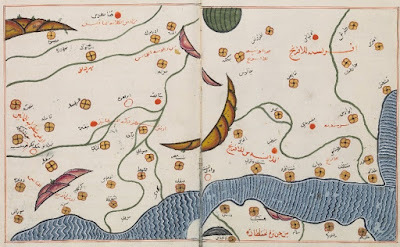 — Anglo-Saxon settlement on the Black Sea', Byzantine Studies, 1 (1978), 18–39 at p. 39; D. M. Nicol, 'Byzantium and England', Balkan Studies, 15 (1974), 179–203 at p. 192. 5. C. Fell, 'The Icelandic saga of Edward the Confessor: its version of the Anglo-Saxon emigration to Byzantium', Anglo-Saxon England, 3 (1974), 179–96 at p. 193; A. Shchavelev, 'A seal of Byzantine "Translator of the English" Patrikios Sphen: its date and socio-cultural context', in H. Ivakin et al (eds. ), Byzantine and Rus' Seals (Kyiv, 2015), pp. 193–200 at pp. 196–8; J. Shepard, 'The English and Byzantium: a study of their role in the Byzantine army in the later eleventh century', Traditio, 29 (1973), 53–92 at p. 64. 6. 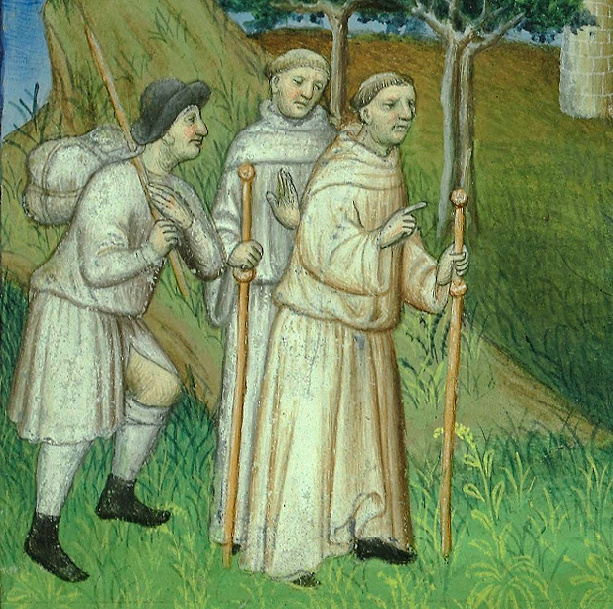 C. West, 'Constantinople, Jerusalem and Canterbury: Joseph the monk and the Norman Conquest', blog post, 18 September 2017, online at http://turbulentpriests.group.shef.ac.uk/constantinople-jerusalem-and-canterbury-joseph-the-monk-and-the-norman-conquest/; J. Shepard, 'The English and Byzantium: a study of their role in the Byzantine army in the later eleventh century', Traditio, 29 (1973), 53–92 at p. 91. 7. Translated in D. M. Nicol, 'Byzantium and England', Balkan Studies, 15 (1974), 179–203 at p. 190. His name may have been Coleman, as the thirteenth-century Laon Chronicle account of the Anglo-Saxon emigrants mentions a man of that name who built a church in Constantinople; the church in question is often thought to be that of Bogdan Serai, especially in light of the apparent survival of grave-markers belonging to English Varangians there until the nineteenth century: K. N. Ciggaar, 'L'émigration anglaise à Byzance après 1066. 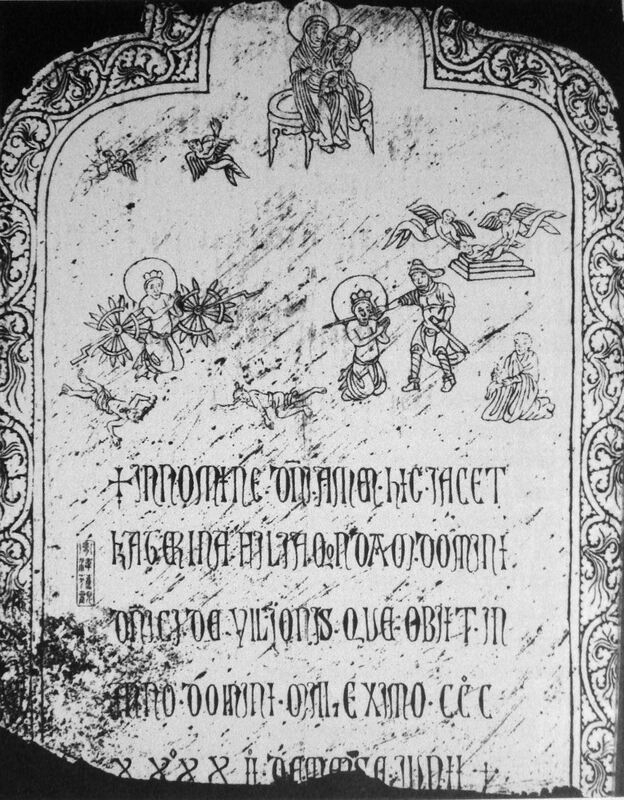 Un nouveau texte en latin sur les Varangues à Constantinople', Revue des études byzantines Année, 32 (1974), 301–42 at pp. 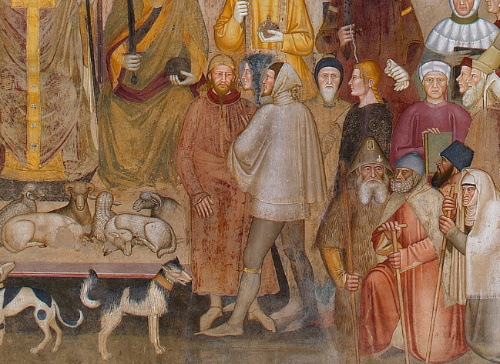 313 and 328; C. Fell, 'The Icelandic saga of Edward the Confessor: its version of the Anglo-Saxon emigration to Byzantium', Anglo-Saxon England, 3 (1974), 179–96 at p. 196; R. Byron, The Byzantine Achievement (London, 1929), p. 147 fn. 1. 8. D. M. Nicol, 'Byzantium and England', Balkan Studies, 15 (1974), 179–203 at p. 187 (translation); K. N. Ciggaar, 'L'émigration anglaise à Byzance après 1066. Un nouveau texte en latin sur les Varangues à Constantinople', Revue des études byzantines Année, 32 (1974), 301–42 at pp. 305, 323 (text, lines 95–109) and 337–8 (commentary). 9. K. N. Ciggaar, 'L'émigration anglaise à Byzance après 1066. Un nouveau texte en latin sur les Varangues à Constantinople', Revue des études byzantines Année, 32 (1974), 301–42 at pp. 305 and 337–8; K. N. Ciggaar, Western Travellers to Constantinople: The West and Byzantium, 962–1204 (Leiden, 1996), p. 141; N. P. Ševčenko, 'Wild animals in the Byzantine park', in A. Littlewood et al (eds. ), Byzantine Garden Culture (Washington, D. C., 2002), pp. 69–86 at p. 79. For a contrasting view, see C. Fell, 'The Icelandic saga of Edward the Confessor: its version of the Anglo-Saxon emigration to Byzantium', Anglo-Saxon England, 3 (1974), 179–96 at pp. 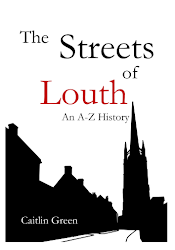 186–8, who considers him to be a mistaken insertion of the deeds of Harald Hardrada into the Laon Chronicle's account of the Anglo-Saxon emigrants.